It’s Christmas Day, and I’m on day 112 of my lifestyle challenge. This past month has been, how do you say, different. Taking a look at this month’s chart and comparing it with the previous three months, we can see that I’ve been kind of flaky. I’ve been drinking more alcohol, going to bed later than my target bedtime of 10pm, and missing a lot of meditation sessions. However — and here’s the the secret sauce — I have continued. I have not “fallen off the wagon” and stopped tracking everything completely, stopped my healthy lifestyle practices, and returned to the moldy soil from whence I came. No, I have persisted. I have continued to track and I have continued to do what I could given the demands of the season, and given the realities of my motivation and energy. It’s actually really important to be able to be imperfect. We must allow ourselves to be imperfect so that we can vector gradually in the direction we choose. If one small slip-up, or even a period of flakiness, is responded to with self-deriding anger, voiced as “I’m so crap! I can’t do this! I’m giving up!” then we really will never make any progress. We really will never sustainably experience the kind of psychological and physical health and wellbeing that we have chosen. Please join me on this challenge as we approach 2017. 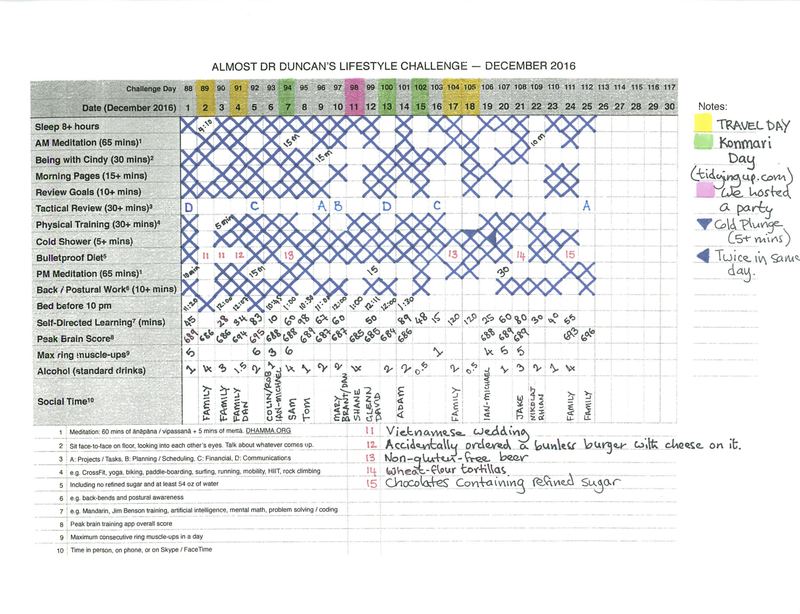 Get your free lifestyle challenge grid. The grid can be personalized, and includes instructions.